PWInsider is reporting that WWE Hall of Famer Road Dogg (BG James) has stepped down as the co-lead writer for SmackDown while Robert Evans, who was about to be fired from WWE, has left WWE. Road Dogg has been working as the co-writer for SmackDown with Stephen Guerrieri since 2016. 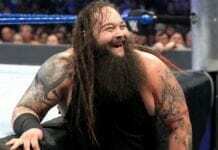 The report from PWInsider stated that James had become increasingly frustrated with changes made to SmackDown scripts by Vince McMahon, and he finally hit a breaking point at this week’s SmackDown. There’s also no word yet on if James will be transitioning into another role with WWE. In another creative departure, WWE Creative Team member Robert Evans left the company on the night of the WWE Hall of Fame 2019 ceremony. The story that is coming out from the company is that Evans was let go after Vince McMahon’s name was mentioned during the Hall of Fame speech by Bret Hart which Evans helped in writing. It is believed that Vince McMahon does not like his name mentioned in the Hall of Fame speeches(D-Generation-X made a huge joke about it in their HOF speech) and when it became obvious the company was going to terminate Evans for the issue, he instead quit before being terminated backstage at the WWE Hall of Fame. He posted over Twitter this morning. Previous articleWhy Drew McIntyre disappeared from SmackDown Main Event?